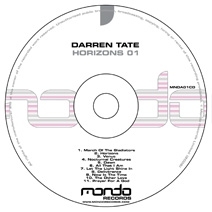 Undeniably Mondo's hottest releases this year comes from trance giant Darren Tate, with his debut artist album 'Horizons 01'. The full 80 minute CD features many of his massive trance anthems such as the 'Let The Light Shine In' and 'Nocturnal Creatures' (with Jono Grant from Above & Beyond), and 'Prayer For A God' as well as six absolutely phenomenal exclusive new singles including the spectacular 'Venus' and 'Horizons'. Delivering in one take some of Darren's biggest tunes to date, 'Horizons 01' is an album of supercharged yet emotional flowing music that personifies his major contribution to modern day electronic music. Darren's blend of hugely uplifting music combined with pounding beats has seen him enjoy major crossover success under guises such as Angelic ('It's My Turn', 'Can't Keep Me Silent' with Judge Jules), Jurgen Vries ('The Opera Song feat. Charlotte Church', 'The Theme') and DT8 Project ('Destination' with Roxanne Wilde, 'The Sun Is Shining', 'Winter'), as well as maintaining a massive credible following via his Mondo releases. Please note: We no longer stock the digipak version of this album. The item will be delivered as shown in the picture in a clear PVC wallet.